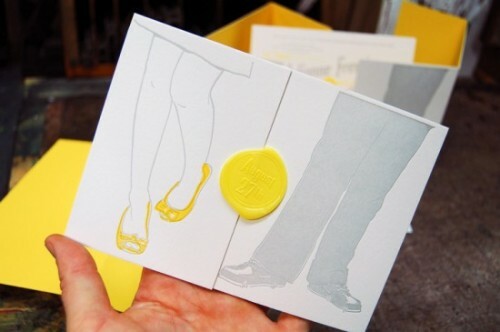 Thanks Oh So Beautiful Paper for finding this yellow and grey invitation set from Mama’s Sauce. Yellow and grey is very trendy for invitations this season and I’ve seen alot of combos – but I have to admit that this is one of my favorites. I thought it was clever to use a wax seal on the invitation itself rather than the envelope. We’ve seen less folks wanting to use wax seals because they are fairly mangled/crushed by the post office – but I’ll have to try this idea out and see how well a seal holds up inside the envelope.